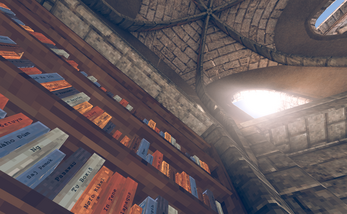 Explore the Library of Blabber, an infinite structure filled with endless bookshelves of eternal nonsense! Can any sense be found? Do answers lie somewhere in there? How long will you stay sane looking for them? Well, you'll have to flip the pages to find out.. Inspired by Jorge Luis Borges' story The Library of Babel, and Jonathan Basile's libraryofbabel.info project, this "little" game is focused on exploration and the fun of meaningful discoveries in the noise of random data. Although it does not posses the mathematical correctness and "purity" of the original story, it still does contain enough pages of nonsense worthy of several hundred lifetimes.. I want a search system that wen you search finds your book title or pages! What is a noise and what is not a noise? What is an information? Answer me, everyone. Library of blabber is much better however the library of babel has been recently updated... in 2018, this one however has not been updated since 2016 :( - This one happens to be my fav despite it being a bit outdated. One thing I was thinking would be cool is a personal bookshelf where you can save books you've found. How do you flip the pages? Because arrows don't work and do most of the books have writing or just certain ones? Is there any way to change the font the books are displayed in? I've come accross (pseudo-) German and French books, but any accented characters don't get displayed (äöüéèà and so on). Interesting, on what system are you? Fascinating concept. I played this about a year ago, and was inspired to look at it again. Unfortunately, I was unable to get it to work on OSX. I'm running macOS Sierra v10.12.6. It gets to the finding books prompt and gets stuck. I'd love to take another look. Is this true procedural? Could I jot down some directions or coordinates to get someone to a book I've found? Could we export a cool book, or possibly in the cover have the seed exposed, to be run through an outside program to get the same text again? This is crazy cool stuff. if you like a certain book, simply screenshot each page and save it in it's own folder. this is really something i would reccomend you to keep updating. if possible you should add more logic to the generation of the text to make more sense of the books. add more history, literature , and more words to the generation. allow the program to generate a new seed each time it is opened. maybe add the option to select the generation of specific languages. Try this, open the program and wander for a few minutes then stop and open a book that captures your eye. read the first few pages to see if the book can predict the near future. if you believe in fate than you have chosen this specific book for a reason. Love jump strange distribution, No situation will excite. Are you thinking about updating ?? hope you have the ability to go down stairs, go upstairs. keep it up, what else might you add to this ?? Going to be an update any time soon? 1. Download it into your ~/Downloads folder. 4. Type: ln -s Data/* . Now you can double-click it and it should run properly. It works great now. Thanks! If you were running on mac, it should work properly now, fixed it! Really amazing. The atmosphere and the graphics are great. I am blown away and have no clue how you seamlessly implemented all of this. Bravo sir, bravo. great stuff- but unfortunately got stuck on OS X laptop, since RMB is required to close a book.. only have LMB enabled on my comp (and CNTRL + click didn't work). I'd suggest just using the spacebar to both open and close a book? I do come across some books that dont even have a title and how can I actually read the books at the top shelf ?? 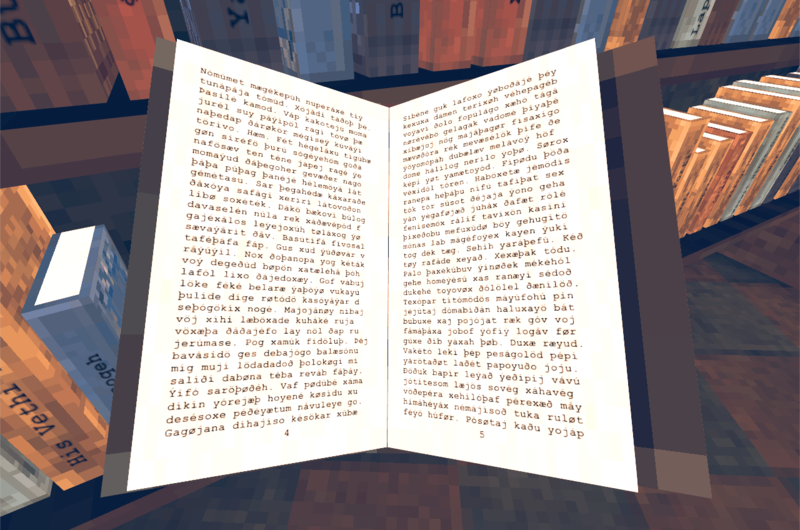 Beautiful and elegant implementation, and it even has books with cyrillic texts ;) Bravo! It's fascinating the way the text seems to be perpetually almost, but not quite, decipherable, or in another language. It's like someone that had a very, very shaky grasp of English went out and wrote an entire library of books. Try picking up a book that seems almost on the cusp of understanding and try pronouncing a page out loud. It's like you're reading some kind of magic spell. I think this authenitc gibbberish could be useful under certain unusual circumstances, like picking words for a magic spell in a story. It might be helpful in making up a fake language, too. It would be really cool if there were random bookmarks or photos in the pages of some of the books. I don't know why but I love the brick texture on the walls, and also there is something strangely addicting about just walking forward and not stopping. Never....ever...stopping. this is interesting and i enjoyed about an hour of playing, then the jibberish made my head hurt lol. 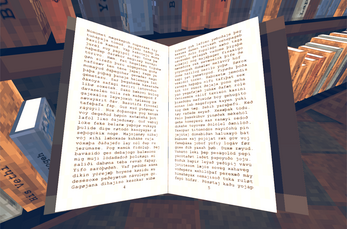 i really liek the idea and would be interested to see an expansion of the idea where the library maybe had other people in it, maybe with their help u can strive to translate the text. Yes, that would make the game very interesting! I would love to play something like that. Would pay too. Wow, congratulations, that's really great. 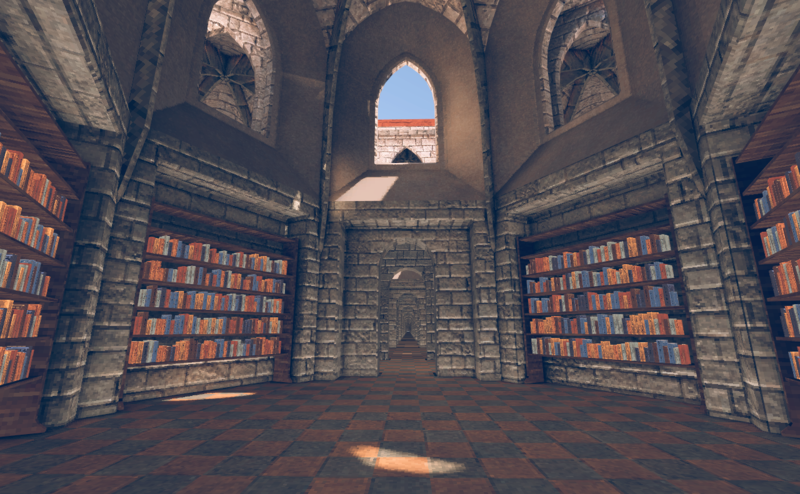 I've been working on a Library of Babel simulation myself, if you want to check it out : http://agar.itch.io/the-unity-of-babel. We should implement on a newer version, like an infinitely generated world with buildings fulll of books, not just on shelves, ability to actually pick them up, drop, read and put them back, ability to throw books around if the player pleases lol. it would be good if the person could add a book in the archives and upload it toa server or something, one way to make it somewhat multiplayer? Fantastic. Have always wanted to explore The Library of Babel. Unfortunately, I did not find this comment written in any of the books I found.